The sample levels from “Loki’s Revenge” included in the shareware version of the game use some very light fantasy elements, such as teleporters (or “worm holes”) and hole names like Scylla and Charybdis. The holes are cleverly designed, and they have geometrically interesting elements. The layout of Scylla and Charybdis is devilish: you can go the long way around or try to putt through a hazardous passageway. Despite the mild fantasy theme, the game is also simple and quiet, mostly just grass and walls. Could this be the last hole?! The mechanics are the tougher part. Putting has serviceable controls: choose an angle, select your power, and go. But you can’t gauge how far the ball will go until you hit it, a grand pain when attempting to plan shots. Given the small course sizes, the pixel-perfect precision needed to dodge obstacles in the small windows is annoying. This is especially the case around hazards like lava and water. Rather than following the standard golf rules where a water hazard costs a point and resets your ball, a miss in The Greens sends you back to the starting point, score intact. Most of the holes in the shareware version are Par 5 or higher (fairly long), and since the game automatically moves on if you make over nine shots, a hazard near the end of a hole usually spells instant doom. With these exacerbating factors, I only successfully completed one hole on my first playthrough – three shots over par. At least the game sort of acknowledges this difficulty. The top-ranked high score is two above the course par. For its mistakes, this game can be tough to get upset at. The little touches are charming, like the lovably dorky MIDI music or the cute menu icons. The “Quit” button jokes about going back to work and plays a door sound effect. There’s a TV with a VCR that replays important shots, like falling into water or completing a hole. The default player names are taken from the staff credits. You can tell the Shadoware team put some heart into The Greens. That doesn’t cover its mechanical shortcomings. There might be fun minigolf here, but you have to putt around the pools of lava to find it. More surprisingly, it doesn’t do much with the fantasy motif apart from putting a picture of a wizard in the corner. 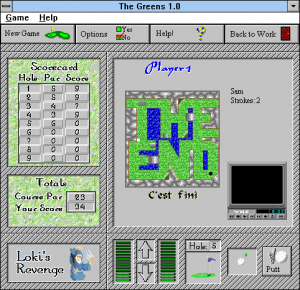 The shareware version has a fraction of the 18 holes promised in the full game, of course, but it’s a little bare. It feels like something was left out. Realistically, The Greens is probably happy being a tiny, plain, good-hearted minigolf game with a wizard picture on it. Take it like a slightly enchanted roadside attraction. I stumbled across your post while searching for the game’s midi soundtrack. That jaunty calypso score is haunting, wistful, happy-go-lucky, and crappy. Like how you described the game, it’s such a crazy/weird mix. Anywho, I’ve always loved that song, and it was enjoyable to read your take on the game, which brought back plenty of 90s memories. I didn’t even consciously register that it was calypso music… in a game with a wizard. What on earth?